Beginning January 1, 2010 you must use the NEW Good Faith Estimate! 50% OFF the purchase of 2 or more Guides. 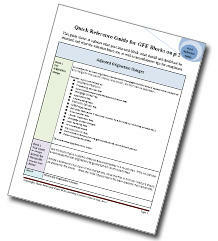 Mary Beth Guard has developed a four-page "Quick Reference Guide for GFE Blocks". It shows at a glance what goes into each block, what should and should not be itemized, block-by-block tolerance limits, and miscellaneous tips for compliance. Purchasing this electronic product entitles your institution to reproduce the Quick Reference Guide in quantities determined by your purchase agreement. Unlawful reproduction beyond the quantity purchases constitutes a violation of copyright law and may result in penalties and fines. A multi-reproduction license of the Quick Reference Guides may be purchased at a discount. Please click on the link under License Pricing to purchase the quantitiy you desire.